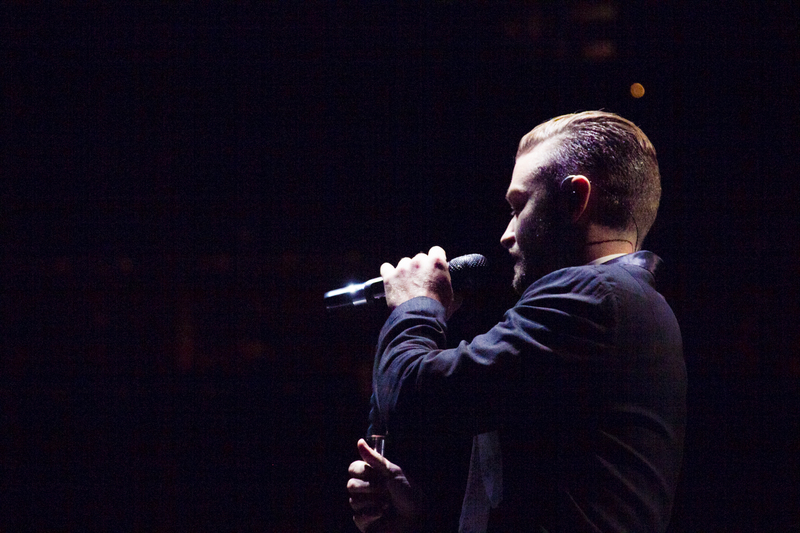 It was clear on Wednesday night when Justin Timberlake took the stage at the First Niagara Center, Buffalo had been waiting a long time for this concert. Earlier this year Justin had to postpone his Buffalo show due to scheduling conflicts. The show was well worth the wait, even the extra forty minutes it took for him to come on stage. The first thing I learned Wednesday night was Justin Timberlake doesn’t stop. Whether it’s dancing, playing (he played the piano, keyboard and guitar at various points throughout the night) or interacting with his fans he’s constantly in motion. They say some people are natural performers, made for the stage and spotlight. Justin Timberlake is on the top of that list. He makes it look effortless. The second, despite being one of the most popular musicians in the world today, he is incredibly down to earth and humble. Not three songs into his set Timberlake made his first of many apologies to the people of Buffalo for the long wait. He even brought up the public apology he made to the city on The Tonight Show with Jimmy Fallon earlier this year – reminding his fans if they left the show feeling unsatisfied Jimmy Fallon would personally give them a massage. Hot stones and all. He played two sets through the night, a total of twenty-eight songs including a handful covers (Michael Jackson, Elvis, Kool & The Gang and Bell Biv Devoe) as well as a snippet of his popular duet with Jay Z, Holy Grail, though his covers of “Human Nature” and “Heartbreak Hotel” stood out the most. Backed with an incredibly talented band The Tennessee Kids, a number of dancers and an incredible stage set up, Justin commanded attention. It was one hit after the other after the other going as far back as “Cry Me A River”, a crowd-pleaser and one of the best songs he performed Wednesday night. The stage itself was something to envy, the best part was when the horizontal cat walk bridge lifted from the stage and took Timberlake and a number of his dancers over the crowd from one end of the arena to the other. He made sure to run the length of the catwalk numerous times, giving the fans on both sides of the arena a chance to see him up close and personal. It was a set up I’ve never seen before. It was truly incredible just to watch it move. The fans ate up everything Timberlake had to give them. At times it was even hard to hear him over the steady stream of screaming and cheering that didn’t let up even for a moment. He made a number of fans nights with quick conversations, including a pregnant woman wearing a Tennessee Kid shirt and a couple who postponed their honeymoon to make it to the show. He read and acknowledged every fan sign he could see. He even took a shot from someone in the audience and made a sincere, heartfelt apology to Buffalo, cheering to “better late than never” and, being an avid sports fan, a toast to the late Ralph Wilson; a truly classy move on Justin’s part. He closed the show with the hit “Mirrors” from his 20/20 Experience album. While it was not the best song he performed that night it was the best choice to end the show, leaving the crowd more than a little satisfied and exhausted. As for Fallon I don’t think he’ll be owing any massages as you would be hard pressed to find a single person in the capacity crowd that left this show unsatisfied.